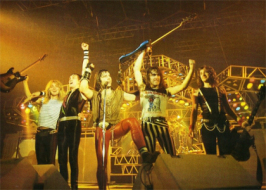 On Wednesday, June 29, 1983, Iron Maiden played Vancouver’s Pacific Coliseum on a bill with Saxon (who had that wicked tune, “Dallas 1 PM“) and Fastway (who had “Fast” Eddie Clarke from Motorhead and Pete Way from UFO). 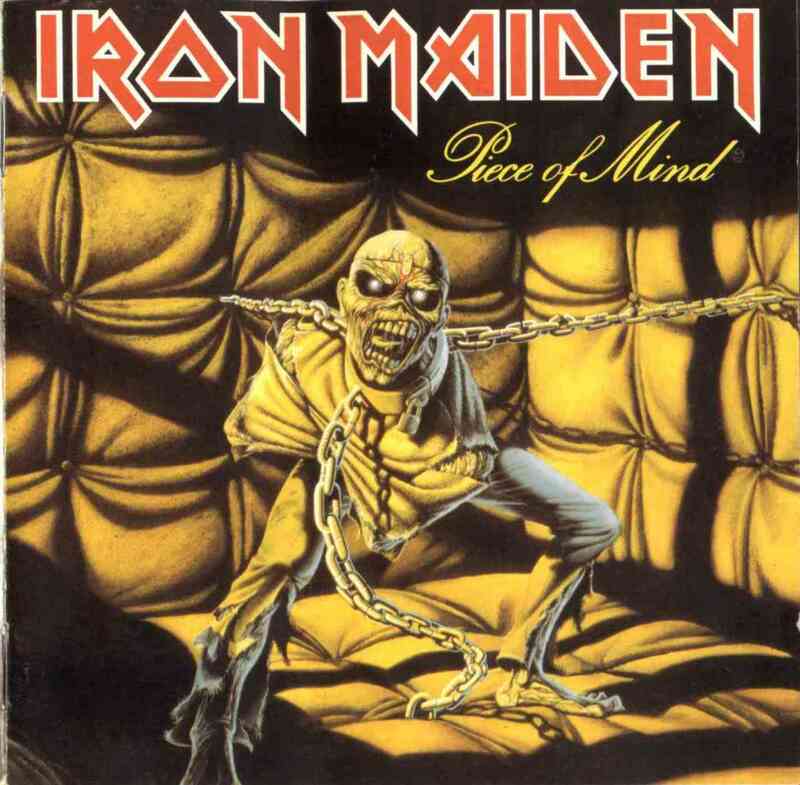 Maiden was touring behind its month-old album, Piece of Mind, which boasted one of its finest tunes ever, “The Trooper”.That was way before the band had its own jet—or even its own brand of beer. In advance of the show I interviewed singer Bruce Dickinson on the phone from L.A. The last time I did an Iron Maiden interview—about a year ago—I talked to drummer Clive Burr. Why is he not in the band anymore? Well he had a lot of personal problems back home, personal and emotional things that really got to affecting his playing. There was a lot of disagreement and a lot ot stuff went down, particularly in the latter part of the last tour to Japan and Australia. But it was a fairly amicable sort of split. I think both parties realized that things weren’t really happening as they should be. How has your new drummer, Nicko McBrain, fit into the band personality-wise? Amazing. Complete maniac. I mean a real nutcase. Is he a much different drummer than Clive? Yes. They’re definitely two different sort of drummers. Nicko’s style is more driving than Clive’s. Clive used to orient things a lot around his tom tom, whereas Nicko is real straight and solid. Piece of Mind was produced and engineered by Martin “Black Knight” Birch, who also worked on your previous albums Number of the Beast and Killers. How have his techniques influenced Iron Maiden over the years that you’ve been working together? His technique is just encouragement, usually. The great thing about Martin is that he’s a very subtle producer in the way he works. He doesn’t actually suggest anything to do with the music at all. I mean we write and arrange the music and then he engineers it and gets the performances out of us. He motivates. Basically we don’t write songs for airplay or anything like that, so we don’t need a producer who produces for that sort of stuff. All we wanted to get was good sounds and a producer who comes along and encourages us. Martin thinks the way we do about the music, so he can be really critical like, “You can do a better guitar solo than that.” Or I’ll be singing away and he’ll go, “I think you can sing it a little bit better than that. I think you can go for one more performance and push it a bit more.” And that’s how he works. He’s always wringing the last drop out of everything you do. Do you find that he and the band have grown together as a team? Oh definitely. I mean it would be unthinkable to do an Iron Maiden album without Martin. Why did you record the new album in the Bahamas rather than in Britain like the other ones? Because we just got fed up with recording things in England. There are so many distractions, like record companies wanting to do interviews. And also, everybody always gets ill in England; everybody always gets the flu or something like that because we’re recording in the wintertime. We’ve already booked the studio for next year. The sound at Compass Point Studio is incredible. AC/DC did Back in Black there. And the new album they’ve just done there too. Your bassist Steve Harris is the most prolific member on the Piece of Mind album; he wrote four of the tunes by himself and cowrote two. Does he usually write most of the group’s tunes? On the first couple of albums, yeah. These last two he’s written about 50%. What methods does he use to compose songs usually? Bass guitar. He writes it all on the bass. And then he usually whistles the melody into a little Walkman and writes down the lyrics. Is the tune you wrote yourself on the new album, “Revelations”, taken from the bible? Well bits and bobs. The first version of it is a hymn I used to sing at school. I was always very fond of the tune and the lyrics. Were you in a choir at school? No, I was just part of the congregation. You had to be a bit of a limp-wrist to join the choir, obviously. You had to get dressed up in white smocks and all that stuff. It was a bit like wearing a dress or something. For his song “To Tame a Land” Steve was inspired by science-fiction writer Frank Herbert and the book Dune. Does he get a lot of his song ideas from fiction novels? Yes–novels or movies. “Where Eagles Dare” is from a movie, and “Quest for Fire” is also a movie. Steve reads a lot of science fiction and watches a lot of movies. We’ve got a video on the bus, so he just sits in the bus and watches videos all day. What is your personal favourite tune on Piece of Mind? “Die With Your Boots On”. Cause it’s a basic live track. It’s got a great chorus, and I think it sums up our philosophy really. Which is die with your boots on. Whatever you’re gonna do, give it your best shot. Just for the sake of it. Unfortunately I wasn’t able to see you live when you played Vancouver last summer with Scorpions and Girlschool. What is your stage show like these days? Do you still bring Eddie on the road with you? Oh yeah, yeah, we’ve got a 10-foot Eddie that comes streamin’ around. And we’ve got a few other effects too. Apart from that, we leap around like maniacs for the whole show. I couldn’t help laughing when my editor told me Eddie’s been lobotomized and handed me the new album cover. [Laughs]. I know. It’s great, isn’t it! Your album covers have always been gruesomely eye-catching. Does Iron Maiden work closely with Eddie’s creator Derek Riggs? Well no, he just keeps on painting and comes up with things. We give him the song titles and the lyrics and leave it pretty much up to him. The album was originally going to be called Food for Thought, but we thought Piece of Mind was better [chuckles]. There’s been a lot of hub-bub in religious circles for the last few years about heavy rock being associated with evil and the devil. Did your last album, The Number of the Beast, cause a lot of people to interpret the band as a bunch of devil worshippers? Oh I think there’s always one or two nutcases that do, but personally I don’t take it very seriously. I think they’re just a bunch of loonies who’ve got nothing better to do with their time.